Regulatory oversight of the water sector in the State Oversight of State government owned corporations involved in the implementation and operation of water schemes. Oversight of urban local bodies, excluding corporations, in matters of financial, planning and management issues. Regulation of political and administrative appointments in the local authorities. Provision of retail water supply services for domestic and industrial purposes in the area of their jurisdiction. Provision of retail water supply services in industrial estates owned by GIDC. Mainly Implementing water supply and sewerage schemes for urban local bodies. Inspection of schemes where State government fund is provided. 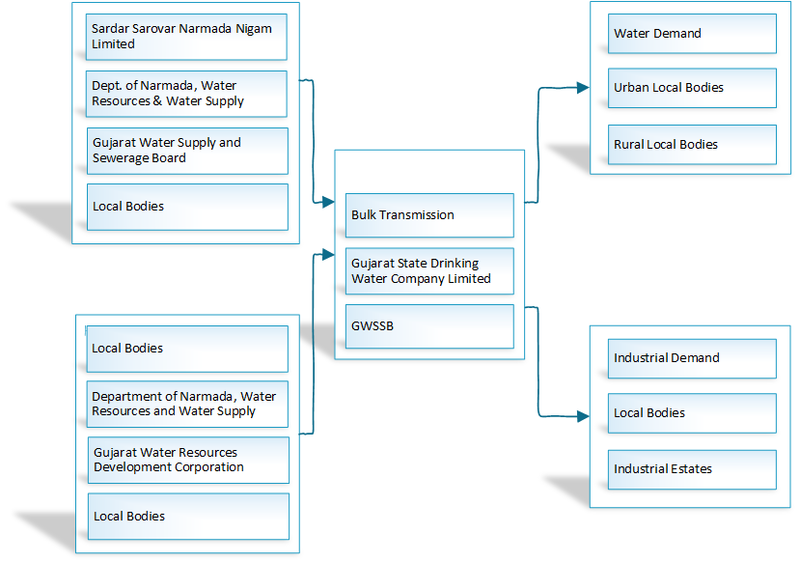 Bulk transmission and bulk supply of drinking water to local bodies, GWSSB, and Industrial estates. Operation and maintenance of some river schemes like the Ukal Dam.